Sculpey, Sculpty, Fimo, Polymer Clay - Which is it? Sculpey, Sculpty, Fimo, Polymer Clay – Which is it? When I tell people that I work with polymer clay, they often look at me with sort of a blank expression. They’ve never heard of it. So I start to explain and pretty soon their face lights up and they say, “Oh! You’re talking about fimo!” Yes, I try to explain, Fimo is a brand name of polymer clay. Then someone else will speak up and ask, “So, is that the same thing as sculpty?” Sigh. I just tell them it is. But that’s not quite right either. It’s more properly called polymer clay. At least in English. First off…there is no “t”. That’s a really common mistake. I see it on Facebook a lot and hear my friends say it. It makes sense, because you can sculpt with it. But sculpty comes from a brand name of polymer clay called Sculpey that’s made by the Polyform company. There’s not actually a single modelling clay called Sculpey. That could refer to Sculpey Original, Sculpey Premo, Sculpey III, Sculpey Souffle, or any number of other products such as Sculpey EraserClay. To most polymer clay enthusiasts, if you use the term “Sculpey”, they will most likely assume you’re referring to the variety of clay called Sculpey III. Since each of these clays is used for different purposes, has vastly different working qualities, you might get completely incorrect advice if you ask about your Sculpey project. Is Fimo the Same as Sculpey? Fimo is another brand of polymer clay made in Germany by Staedtler (it’s roughly pronounced Sted-ler). And just as with Sculpey, there are several products that one could mean by using the word “Fimo”. Fimo makes Fimo Professional, Fimo Classic (though this is phasing out), Fimo Soft, and Fimo Kids polymer clays. There’s even Fimo Air, an air-dry modelling clay that isn’t actually polymer clay. Polymer clay is a type of modelling clay that doesn’t dry in the air and instead is cured by baking in an oven, typically between 230°F (110°C) and 300°F (150°C). We all know and love it as the material to make beads, jewelry, sculptures, figurines, toys, art, and many decorative objects. Polymer clay is made from powdered polyvinyl chloride (PVC), plasticizer, binders, fillers, colors, and lubricants. When baked, the PVC particles soften and dissolve into the plasticizer, creating a solid fused mass of plastic. The longer you bake polymer clay, the more complete the fusion will be and the stronger the result. Polymer clay is not the same thing as ceramic or earthenware clay. Those are essentially mud (well…it’s refined and cleaned and manufactured to be uniform). Even though polymer clay is a synthetic modelling clay, some of the same minerals that are in pottery clay are also used as fillers and binders in polymer clay. 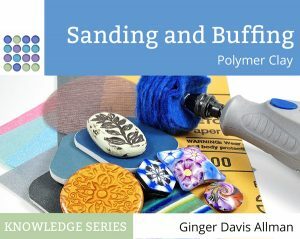 So depending on the brand, you may find bentonite, kaolin, talc, and chalk in polymer clay. But pottery is fired in a kiln at a much higher temperature and the chemistry and working qualities are very, very different. 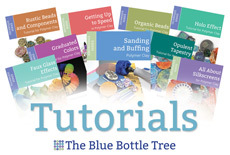 You may have seen some recipes for “homemade polymer clay” on Pinterest or YouTube. Don’t be fooled. That is most certainly not polymer clay. Though you can make a huge variety of really cool modeling clays from materials found in the home, polymer clay is something that must be purchased in a store. The ingredients are not the type of thing you can find at home or get from the hardware store. There is an air-dry clay called cold porcelain. It’s made from such things as white glue, borax, lemon juice, lotion, and cornstarch, and can be homemade or purchased from people who make it. A lot of people who don’t have access to polymer clay use this material, especially for making flowers. But please don’t assume this is anything like polymer clay. While any modelling clay does have many techniques in common, if you try to use cold porcelain in many polymer clay techniques (such as caning or mokume gane) you’re going to be very frustrated. It’s just not going to work. As an aside, if you like to make various homemade play clays, I highly recommend the book Mudworks. It has 125 recipes for every kind of play dough you can think of. If you have kids, this is a wonderful book. What are Some Brands of Polymer Clay? There are lots of brands of polymer clay available all over the world. Fimo from Germany and Sculpey from the US have already been mentioned. You can also find polymer clay by Cernit (Belgium), PVClay (Brazil), Kato Polyclay (US), Clayologie (South Africa), Du-kit (New Zealand), Pardo (Germany), and Garie Sim’s Play Clay (Singapore). Each has its own qualities, strenghts, weaknesses, and of course, its own fans. If you don’t like how one brand of clay works for you, try another. Michaels has the Craftsmart brand of polymer clay. HobbyCraft in the UK has Shape It! Make & Bake Clay. There are any number of un-branded collections of polymer clay that can be found cheaply in dollar stores or online on sites such as Ebay. Are those polymer clay? Yes, in most cases they are. Do you want to use them? Well, all I can say is “buyer beware”. Established and reputable manufacturers create a line of clay to meet certain performance standards. They generally have good quality control that leads to a uniform, high-performing product. The store brands don’t always have this kind of dedication to quality. They’re often very hard and crumbly and lead to a weak product. You’re going to enjoy your experience more if you buy a quality, brand name polymer clay. So whether you’ve always called it Sculpty, Sculpey, Fimo, polyclay, or just plain old polymer clay, it’s all the same type of material. It is a lot of fun and extremely versatile, too. Have fun, and Happy Claying! Great review and thank you so much for mentioning “Sculpty”. It’s one of those pet peeves of mine whenever I see it or hear it. It’s kind of like calling Sherbet “Sherbert”. I don’t know where those misspellings started, but they’re super common. Hi, Cernit was at a time a German brand but is now produced in the Walloon part of Belgium. For 8 years I’m working (full time) with polymerclay, I’ve a large stock of all colours of all brands, and indeed, depending on the project you have to search for the right claybrand. Pardo art Clay is way above for canes! Oh yes! You’re right, of course, I’ll change that! Thank you! And I have heard wonderful things about pardo for canes. Though it can tend to crumble a bit when you slice it, I’ve heard. I tried Pardo when I had the chance to buy some on sale, and loved it. I haven’t seen that it crumbles when you slice it. I think it’s probably a bit pricey (I mostly use kato and premo) – but it’s instantly ready to use with no preparation and comes in many beautiful colours, some with glitter. Quite luxurious. I don’t make canes, so I don’t know about raw Pardo crumbling when you slice it, but I do know that the trick to strong and flexible BAKED Pardo clay is that you have to bake it for an hour. No matter what the thickness, thin or thick, bake it for an hour at the recommended temperature. Pay no attention to the baking time on the package. Make sure it’s tented with foil in the oven and on a ceramic tile to avoid burning from temperature spikes, and not too close to the heating elements. The prolonged baking time increases the strength and flexability dramatically. The same goes for Sculpey Souffle. I agree completely about Pardo. I have seen it many times myself. I didn’t know that specifically about Souffle, but I do know that most clays get phenomenally stronger with long bakes. I did some Fimo Pro recently that I absolutely could not break with my hands. It really surprised me. I had been using Kato a lot, but recently Premo has come into my life and I like the softness for some things very much…good to try the different ones! Oh, yes, then there is that translucent Pardo…mmmm, but priced WAY high when the shipping charge was added! Oh, well…it was worth it! I do use Premo when I want a quick project and can’t be bothered to deal with the crumbs of Kato. It is satisfyingly soft, yes. And the Pardo…oh yes…it is SO worth it. It truly is. Thanks for mentioning polymer clays from China sold on eBay and Ali Baba. They are very inexpensive, and I’ve been tempted to order some just to see. Some are even advertised as “fimo, the leading brand of polymer clay.” (Note the lower case F!) I’m wondering if anyone here has actual experience with them. Yes, I know that Tonja Lenderman did test some. Sometimes they’re hard, sometimes they’re too soft. Thing is, these companies make polymer based on what raw materials are cheap at that moment, and the quality of the product changes drastically over time. So you might get a batch that’s really nice. But the next one very easily might not be. When you pay for a label, you’re paying for a QA department and consistent, predictable results. There’s also the factor that many pigments used in art materials are heavy metals and therefore extremely toxic (think cadmium, arsenic, and mercury). I’m not sure I’d trust that non-toxic pigments are being used. Okay… so what’s the favour? The bit about sharing your thoughts if you’ve purchased previously maybe? Yes, sorry, Claire’s right! I just meant that bit up top about leaving a review. All that Sculpy III that I have? I just threw it out. Or is there something else that it would be good for? It’s perfectly good for making round beads, as those are structurally pretty sound. You could also mix it with a stronger clay, such as Kato. Sculpey III isn’t necessarily a bad clay, it just has limitations and there are better options for anything that requires thin areas. As long as you stay thicker than 1/4″, Sculpey III should work just fine. Some of the colors darken (such as red and yellow) but if you plan for it, you’ll be fine.